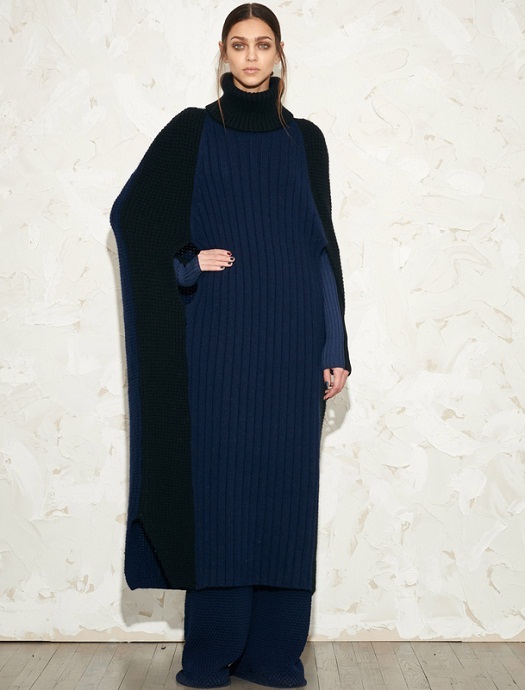 After a decade-long hiatus, designer Victor Alfaro made a very intimate yet impactful comeback defining luxury as comfort and presenting impressive, wearable and statement-making knitwear in exaggerated silhouettes. The collection revolved around the idea of the jumper, the pajama, and the cozy track pants; loungewear, in general, twisted to look equally chic outdoors. There were even pieces reflecting the qualities of a blanket or a sleeping bag. It’s definitely the clothes you would like to wear during a flight and then elevate them through high quality leather accessories (belts, handbag, booties) into almost-any-occasion outfits! 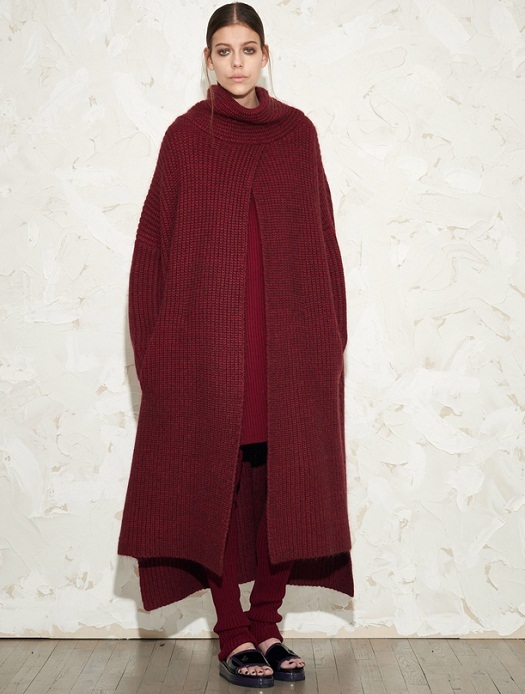 Details that I adored were the rich cowl- and turtlenecks, the elongated chunky knit dresses over pajamas, the oversized fringed scarves, the cape-like styles, the culottes, the extra-wide-leg pants, and one mishmash sweater with red, white, and black asymmetric motifs and design. The designer styled models to perfection with flatform sandals, undone low ponytails, a smoky eye, and absence of unnecessary accessories. There was some signature sporty vibe in the collection but it was mostly a woman maturing a bit and carrying on with this attitude throughout her life. The palette was modern and fresh including black, white, crimson red, burgundy, navy, and dove grey, mostly in monochrome looks that elongate the figure. It was both the colors, and the interesting textures that got much of the attention from those attending the presentation. Personally, I would love to see more in the upcoming seasons; it felt like a great restart!